Life in Mexico is in many ways of course, like life anywhere, with its errands and processes. Imagine yourself living in Mexico or another Spanish-speaking country and one of the five following occurs. A hotel with a good oceanfront restaurant is next door. It's late. You sure don't feel like driving anywhere. Maybe you'll get it to go. You walk in and the servers tell you they only take credit cards now. New policy. You aren't carrying one. The servers beg you to complain to management. Scenario Two: You need to run an errand and your car is in the shop. You could call a taxi, but frankly, you'd rather Uber. Uber drivers arrive faster, and have consistently spotless, air-conditioned cars. You use the app. As happens with Uber everywhere, the Uber driver calls you to tell you he's arrived but he can't find you. Scenario Three: You have a bureaucratic process to attend to. You have all your paperwork ready and have a meeting to determine what's next. Scenario Four: You've come up with a complicated dental problem. You have learned that the vice-president of Mexico's periodontist lives in your town. You want to set an appointment. You've been told he doesn't speak English. Scenario Five: You are walking dogs for a friend of yours at night and pass a gang of teenagers. They appear to be regular upper-middle class kids. In spite of that, one of the teenage girls approaches you, and rather aggressively asks you why you are walking the dogs so late at night. All of these scenarios are true and happened to me within a 10-day period. Yes, you can live happily in Mexico without Spanish. But your life will be transformed for the better by knowing it. You can learn over 50. Whether you like the "assorted chocolates" concept behind my book, the Interactive Guide to Learning Spanish Free Online or prefer a more conventional approach, if you are moving to Mexico, you will need it. 1. The Restaurant - Being a (starving) red-neck from Oklahoma, I was more than willing to complain to management. In Spanish, I told the supervising manager that their policy would drive away foreign tourists (U.S. dollars). Knowing the reason was probably theft, I added that punishing your customers was no way for a chef to learn inventory management. What happens when restuarants don’t take cash. The supervisor personally escorted me back to a table for dinner and assured me that my cash would be taken. My four servers only lacked fanning me with palm-fronds in demonstrating their appreciation. I felt like a cross between Queen Elizabeth and Che Guevara. 2. Using Uber - With Spanish, you can tell a drive which street corner you'll be waiting on and what you're wearing. Taking Uber without some Spanish is uncomfortable. For one thing, almost all of them drive itty-bitty fuel-efficient cars, which forces you into the front seat, inches from them. Very few of them speak any English. Awkward. .You could hire a taxi driver for this too, at about the same cost. More of them speak some English. The low profile of being ferried around by a Uber driver beats taxis by a mile. Uber drivers are generally social and accommodating (Check their ratings when you connect). I collect phone numbers of the ones I really like to hire them off the books now and then for a morning of errands. I wouldn't drive a car in a Mexican town that had Uber town even if I had one. Uber drivers have given me plenty of information I’ve needed, whether it's where to get a new phone battery or how many buses serve neighborhoods I'm considering moving to someday. One told where to buy the organic oatmeal cookies he made in his other business. 3. The Bureaucratic Process - Imagine yourself working at a consumer agency in the U.S. A consumer comes in with a complaint and speaks no English at all. The next one comes in, speaks some English, and goes on to mention that he studies every day. Which would you be more predisposed to go out of your way for? I often notice a marked difference in reception, even when I mangled the language totally. At least I was swinging. 4. The Periodontist - Through other expats, you will probably always be able to get the name of a competent medical professional who speaks English. Many doctors, dentists, and specialists were trained in the U.S.
That being said and knowing the effort it takes to learn and retain a second language, I'm not sure if you will always have "best-specialists-who-speak-English" as a subset of "Best Specialists" in every category, everywhere. In this case, the doctor didn't speak English, but his assistants and receptionist did. If I didn't speak Spanish, I might not have called to make the appoint at all after having heard he didn't speak English. 5. The Teenage Girl - Without Spanish, I'm not sure if I would have known how to reply because I might not have understood her question. With Spanish, I told her I wasn't too afraid of being attacked while I was holding a steaming bag of dog poop in my hand. (I might have said boiling poop but she got my point, laughed and re-joined her group). I am far from bilingual. When I focus, my Spanish is quite good. If a phone call in Spanish wakes me up in the morning, I might as well be speaking Mandarin. Yet, learning Spanish has made a profound difference in my life here. Studies have shown that learning a second language outperforms any "brain-game" program in improving your memory, perception, and decision-making. It staves off Alzheimer's and dementia. A friend once advised me. "If doing something can help you and has no downside, it's a no-brainer." In this case it’s better brainer. If you still don't know if you're moving to a Spanish-speaking country, Learn it to exercise your brain while you decide. You can't lose. The worst that could happen is your brain will thank you. When you start a physical exercise program, you dread the effort at first, in spite of its manifold benefits. Once you realize some gains - you feel better, you lose some weight, you fit your clothes better, it becomes a habit. Finally, it becomes a habit you enjoy because you've received so much in return. Learning Spanish is like that. Once you expressed an abstract idea in Spanish the first time, conquered the many uses of the ver "llevar," or made a friend who doesn't speak English, studying becomes more exciting. When you take the language to the next level and disarm someone with a bag of dog poop, you will realize your how much your investment has contributed to making your days cheaper, safer and easier to control. Related links: Always and adventure when you're learning a second language, especially if you telling casually telling someone a friend died. Coming up: Maybe we should revive this old custom in America that Mexicans still practice with alacrity. Most recently: Mexico's consumer protection agency can be surprisingly effective. Don't make the mistake of thinking it's Mexico's Better Business Bureau. PROFECO might actually help you. Hola, I'm Kerry Baker is the author of the "Interactive Guide to Learning Spanish Free Online," a curation of the best free online tools to learn Spanish, with sample lesson plans to help you create a different learning experience every day. 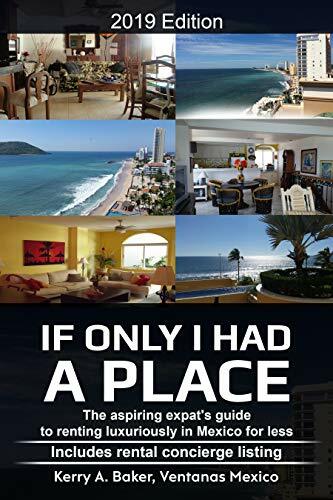 Most recently I released "If Only I Had a Place," a guide to renting in Mexico luxuriously for less. The book includes a listing of rental concierges, ambassadors for Mexico's most popular expat destinations. Where Do You Go When Things Go Wrong in Mexico?